The artist Adam Chodzko has often used prints - usually posters or flyers - to set in train a sequence of events which become the work of art. His practice has been described as "occupying a territory between fiction and journalism." Many of his projects begin with an intriguing ad in the pages of Loot, or a flyer handed out in the street. He uses these strategies to find volunteers who will become collaborators in a larger work. Using the methods of advertisers, promoters, and casting directors Chodzko initiates narratives about consumption, self-image and social networks. 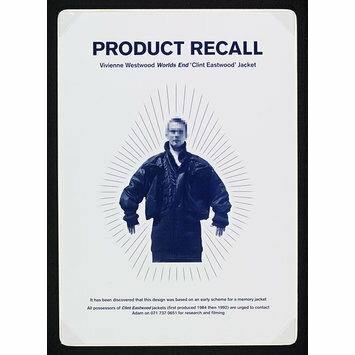 This is the flyer distributed in London for Product Recall in 1994. It invited owners of a particular style of jacket designed by Vivienne Westwood to contact the artist. 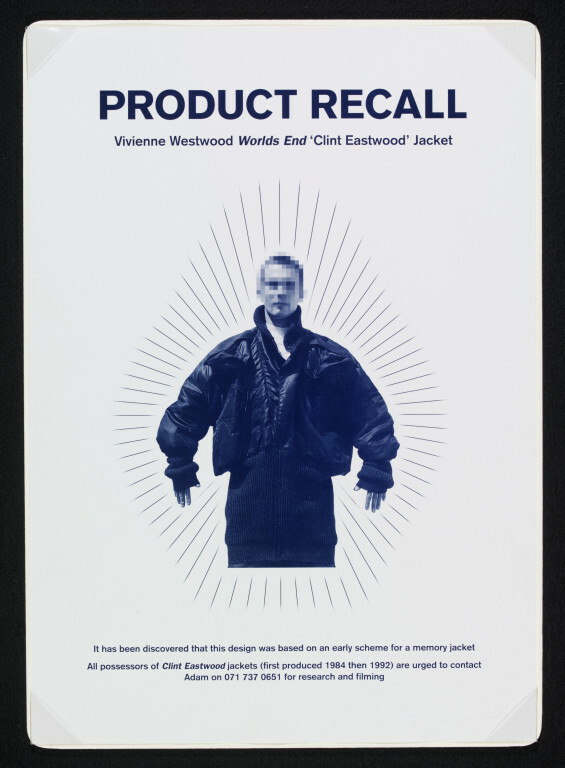 The design of the jacket itself was influenced by Westwood's reading about the so-called 'memory theatres' of pre-literate societies. Those who replied to the flyer were invited to a party where they shared reminiscences about the buying and wearing of the jacket, and Chodzko made a short video to record the event.